The tip he shares is similar to something I do during final performance preparations: I jot two or three key reminders on a sticky note (“Take your time and breathe,” “Keep fingers relaxed,” etc.) and stick them at the top of the page, covering the first few notes. That way when I get on stage I can make myself remember and focus on those few key items, rather than stressing myself over all of the details, and I give myself an extra moment to think and relax while I move the sticky note out of the way. Teacher: Play it again from measure 12, this time with better posture. Something that has worked well for me when I find myself in this situation is to use a repeating timer. This can be a gadget, or, increasingly commonly, a smartphone app, that just beeps at you every few minutes. (I’ve been using Elapsed for iPhone, which is free and supports multiple simultaneous timers, but there are many, many options available.) 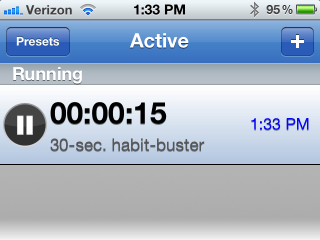 At first I might set a timer as short as 30 seconds, and choose a single habit to focus on. Depending on the habit, I might stop playing to readjust what I’m doing each time the timer beeps, or I might readjust on the fly and continue. When I’m consistently making it through 30-second intervals without having to fix something on each beep, I can adjust the timer for longer intervals. It’s surprising how easy it is to let my mind wander—even within a minute or less—and go into auto-pilot mode, losing track of what I’m trying to accomplish and further calcifying bad habits. The timer technique is a nice aid for me to keep myself focused on a specific improvement I want to make in my playing.